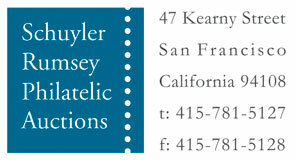 (Mail Routes) New York & California Steam Ship Line For San Francisco. 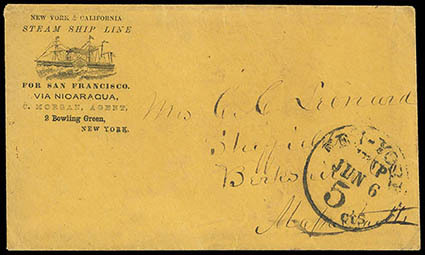 Via Nicaragua, C. Morgan, Agent., illustrated steamship corner card on cover to Sheffield, Mass., "New - York, Ship 5 cts., Jun 6" cds, Very Fine, a rare advertising envelope from this short-lived line (March to July 1853), ex-Polland. 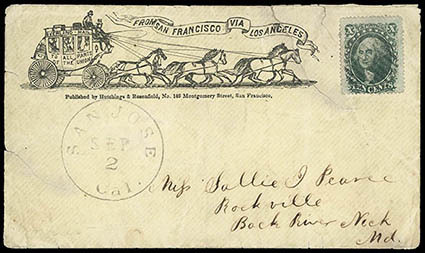 (Mail Routes) Overland Mail - From San Francisco Via Los Angeles, illustrated Six-Horse Stagecoach design with Hutchings & Rosenfield imprint below, on cover to Rockville, Md., franked with grid canceled 1857, 10¢ green, type V, matching "San Jose, Cal., Sep 2" cds; sealed cover tears with one affecting design, Fine. Scott No. 35 Estimate $400 - 600. 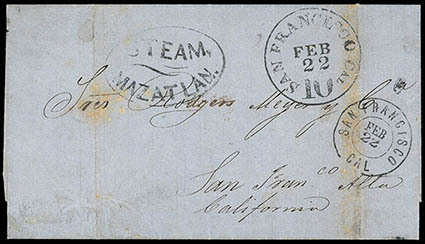 (Mail Routes) Steam Mazatlan, oval handstamp and "San Francisco, Cal., Feb 22" cds (Williams SAF-600) on incoming folded letter datelined "Fuerte, Jvre 28 de 1865", with additional "San Francisco, Cal., 10, Feb 22" integral rate cds used as due marking (William SAF-330); cover with some light toning along file fold, otherwise Very Fine, and a very rare usage from El Fuerte, Mexico. The letter would have to have crossed from Republican held territory into French held Mazatlan for a steamship to San Francisco, so this may explain the long time between writing in Fuerte and receipt in San Francisco. 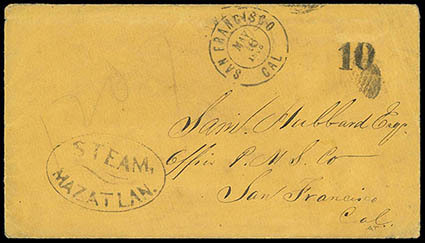 (Mail Routes) Steam Mazatlan, oval handstamp applied at San Francisco on inbound covers, postmarked "San Francisco, Cal./May 16, 1865" double circle and addressed to the Office of the P.M.S.Co. in San Francisco with black "10" due rate handstamp for the steamship rate; small flap fault, Very Fine and scarce short-lived steamer marking.